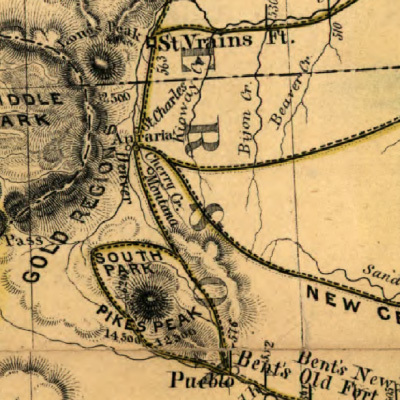 1859 map showing Pikes Peaks altitude as 14,500. How tall is Pikes Peak? During the first recorded ascent of Pikes Peak in 1820, Dr. James and two men spent the first day and most of the second day of the three-day trip to reach the summit. On the morning of the third day, they awoke to smell of smoke coming from the ravine to the north. As it turns out, the campfire they had left the previous morning had turned into a full blown forest fire and now ravaged acres of the mountainside they had climbed on the way up. As the naturalist with the Long’s Expedition, this had to be quite embarrassing for Dr. James. Men stationed in the Signal Station at the summit of Pikes Peak in the late 1800s spent long hours alone. Visited only by an occasional climber and the provision-laden burro, the isolation felt by the weathermen must have been unbearable. To ease the monotony of this solitude, some of them let their imaginations create more exciting yet rather unbelievable events. One of the first more outrageous reports was by Sgt. Robert Seyboth, who telegraphed that on one of his recent climbs he had seen a sea monster in Mystic Lake. Light brown in color and having small eyes, this monster was at least 100 feet long. In 1876, Signal Station attendant Private John O’Keefe, told tall tales of life in the station to lawyer, newspaper man and drinking buddy, Eliphat Price. O’Keefe recounted a story of large, man-eating rats that lived in caves on Pikes Peak. The story then grew to include how these rats attacked him and his wife and daughter in the station itself – devouring a side of beef in less than five minutes. While Private O’Keefe tried to protect his family using a club to fend off the rats, it was actually Mrs. O’Keefe who saved the day by electrocuting the rats with a coil of wire connected to the signal station’s battery. According to the story though, her efforts were too late. Before she could connect the wire to the battery terminals, hundreds of these killer rats had already devoured Erin, the O’Keefe’s only daughter. The alleged grave of Erin O’Keefe on the Summit of Pikes Peak. Two years after being transferred off the mountain, Private O’Keefe returned to the summit of Pikes Peak and the Signal Station – this time as a Sergeant. With his promotion in rank, he also developed a promotion in his storytelling. His first yarn was about how the mountain had turned into a volcano, and that he had witnessed a massive eruption that shot lava, ashes and smoke into the air, and that town of Colorado Springs below should be quite concerned for this was only first eruption and that many more would follow. He compared the eruption second only to Mt. Vesuvius, which he had allegedly witnessed as a boy in his native Italy. Well, this was quite a trick indeed, for the last significant eruption of Mt. Vesuvius had occurred over 18 centuries earlier – in 79 AD. Shouldn’t it be spelled Pike’s Peak? 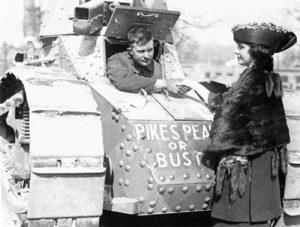 As a publicity stunt to sell Liberty Bonds, a World War I tank “attacked” Pikes Peak in 1919. Despite its best attempts, the six-ton “Little Zeb” and its three-man crew were “defeated” by the ten-foot snow drifts 12 miles up the highway. Much like its namesake, “Little Zeb” never made it to the top. The tank was an American-made M-1917. Were Levis around in 1929? Starting on March 25, 1929, Bill Williams from Hondo, Texas spent 21 days on the Pikes Peak Highway pushing a peanut to the summit with his nose. It is said that he wore out 3 pairs of shoes, 12 pairs of gloves and 150 peanuts. No information about the conditions of his jeans (or knees) was available. Wheelbarrow pushed to summit of Pikes Peak. In 1949, Larry Hightower from Ellensburg, WA, pushed a wheelbarrow to the summit on the Pikes Peak Highway. This famous “wheelbarrow pusher” was best known for his intention of pushing a wheelbarrow around the world. “Pikes Peak Guy” takes photos of landmark every day for one year! Starting on June 1, 2010, local resident Shaun Daggett climbed up, drove around and clicked away every day for 365 straight days to capture a full year of photos on and of Pikes Peak. Despite the hardships of broken down vehicles, falling down hills, and not-so-friendly interactions with wildlife, he did not miss a single day – all while holding down a “regular” job and being a single parent. Read his blog or visit his web site to learn more. Man spends birthday climbing Pikes Peak five times! Two years earlier, Wied hiked up and down Pikes Peak three times on July 31, 1982. This endurance junkie is the only person known to have hiked up Pikes Peak five times in a single day, and up and down Pikes Peak three times in a single day. In 1995, a local piano mover convinced a team of people to push a 550-pound Steinway piano up the last seven miles of the Pikes Peak Highway. He must have been pretty convincing. They repeated the feat in 1996, too. Also in 1995, six students and two teachers from a local high school dribbled basketballs and volleyballs from the tollgate to the summit on the Pikes Peak Highway. The funds raised were used to purchase new computer equipment. 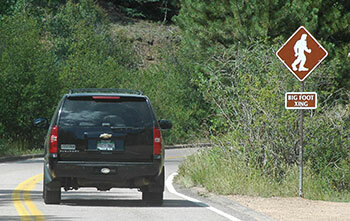 Bigfoot Crossing Sign on the Pikes Peak Highway. In June 2001, a family visiting Colorado Springs drove up the Pikes Peak Highway. While posing for a photograph near Crowe Gulch Picnic Area (MM 3), an 11-year-old boy spots a Big Foot-like creature crossing an open stretch of grass. His nine-year-old brother is the only witness. Their father was the one taking the photograph, and had his camera in hand at the time, but did not turn to snap the shot. By the way, this is not the first or only sighting of a Big Foot in the area. In 1997, several eye-witnesses spotted Big Foot just off Highway 24 about six miles west of Manitou Spring (or about 2 miles east of the Pikes Peak Toll Gate). In 1998, a hunting guide spotted a creature that was seven feet tall, covered in dark fur and walked upright on two legs. After the creature left the area, the guide looked at the tracks left behind and estimated the creature’s foot print was 8-10 inches longer than his own size-10 boot. Some people see elephants and cruise liners in the clouds. Colorado Springs residents can see Abe Lincoln in the shadows of Pikes Peak, twice a year. That’s when the sun and the south side of Pikes Peak cast a shadow resembling Abe Lincoln. Best dates to view: midday in late February and late October. Best viewing location: somewhere between E. Uintah Street and E. Fillmore Street in Colorado Springs. In 2004, Crayola Crayon produced a limited edition set of its 64-color box. In the collection were colors for the 50 U.S. states plus Washington DC and Puerto Rico and 12 Patriotic Colors. The color chosen for Colorado was Pikes Peak Purple. Other related colors included Amber Waves of Grain, America the Bluetiful, Dawn’s Early Light, Fruited Plains, Purple Mountain Majesty and Sea to Shining Sea. In 1998, Hot Wheels released the “Pike Peak Celica” model of their miniature toy car series. Designed to mimick the racers running in the Pikes Peak International Hill Climb, the color of the paint and other accessories on the model changes from year to year. In 1999, Hot Wheels also started producing the “Pike Peak Tacoma” trucks.